As temperatures fall, restaurants are adapting their menus to reflect the season. I am invigorated at the apples, sunchokes, sweet potatoes, squash, and brussels sprouts that are popping up everywhere in various shapes and forms. And while many are appalled by the proliferation of pumpkin-flavored everything, I am captivated by the smell and taste of the orange-colored gourds. 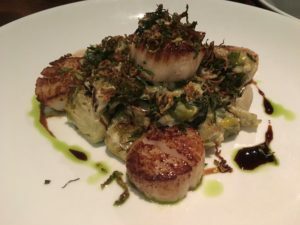 A dinner at Proof in DC’s Penn Quarter fulfills my fall fantasy. Proof has a solid reputation, surviving an onslaught of competition with creative modern American cuisine. The extensive wine list, darkly appealing decor, and fairly recent acquisition of Chef Austin Fausett as Executive Chef, provide added panache. Chef Fausett comes from the well-regarded Trummer’s on Main, and prior to that was a Sous Chef at the Inn at Little Washington. A seat at a well-padded high-backed booth at Proof affords the opportunity to hear one’s companions, and that’s always a plus in this era of restaurants where shouting across the table is the norm. Of course the noise factor depends on who else is in the dining room, and how much of the wine list they’ve sampled. Sunchoke soup is jazzed up by apples and pumpkin butter. If it’s on the menu when you dine here, don’t miss it. 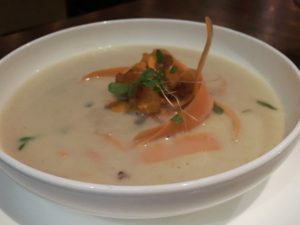 The soup is luxurious, with layers of autumnal flavors. Cubes of curried dates provide a hint of sweet and an unexpected chewy texture. Sunchoke chips add crunch. An over-used phrase, which usually makes me cringe, is autumn (or whatever season it is) in a bowl. Nope, won’t say it- wink, wink. 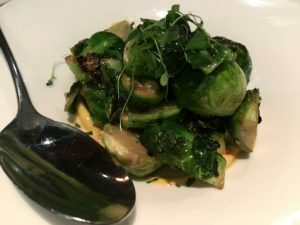 What is fall without a brussels sprouts dish on the menu? Frankly, unthinkable. Chef Fausset does it right, with the addition of kimchee mayo and Vietnamese dressing. The glistening vegetable is a thing of beauty. Octopus skordalia with toasted almonds, arugula, lemon, and sea beans suffers from too much salt. My friend hesitatingly sends it back to the kitchen, and an apologetic Chef Fausett rushes to the table to offer a replacement, and explains that an extra toss of the salt shaker was an error. I am finicky about octopus preparations, and find the main ingredient to be cooked just right, saltiness aside. Dishes at Proof gain their influence from around the world. There is paparadelle pasta with goat and harissa, grilled pork chop with kimchee, togarashi, and black garlic sauce, and crispy pig’s head croquetas with smoked piquillo peppers, mojo verde, and eggplant picadillo. 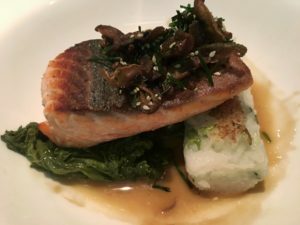 Ora King Salmon has an uplifting Asian accent, resting on a bed of pickled mustard greens and a sticky rice cake, and topped with shitake mushrooms and shoyu sauce. Scallops a la Michel Richard, pay tribute to the late chef. The luscious dish incorporates apples and confit leeks, and a topping of crispy brussels sprouts. Is there anything better than fall desserts? 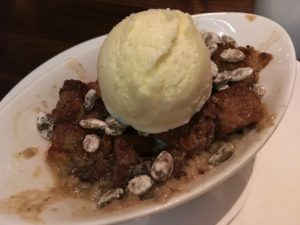 Maple bread pudding with sweet potatoes, pumpkin seeds, and a scoop of ginger ice cream has me thinking, no there really isn’t. What more can I say? Proof…I think I’ve fallen for you.